If you are gluten free or just want to cut back on grains, etc, this is a delicious granola to have on hand all the time. I was buying a really delicious one from Whole Foods but it was expensive and so I thought why not make it at home!! I am not gluten free but I like to cut back on grains, etc where ever I can… so my usual lunch of yogurt and fruit is delicious with a handful of crunchy, yummy granola! Mix all the ingredients in a large bowl and keep aside. Preheat oven to 325 degrees F.
Add all the ingredients to a glass measuring cup and microwave for a minute. Mix well and add to the nuts. Transfer the ingredients to a large lined cookie sheet. Spread and bake for 20 minutes. 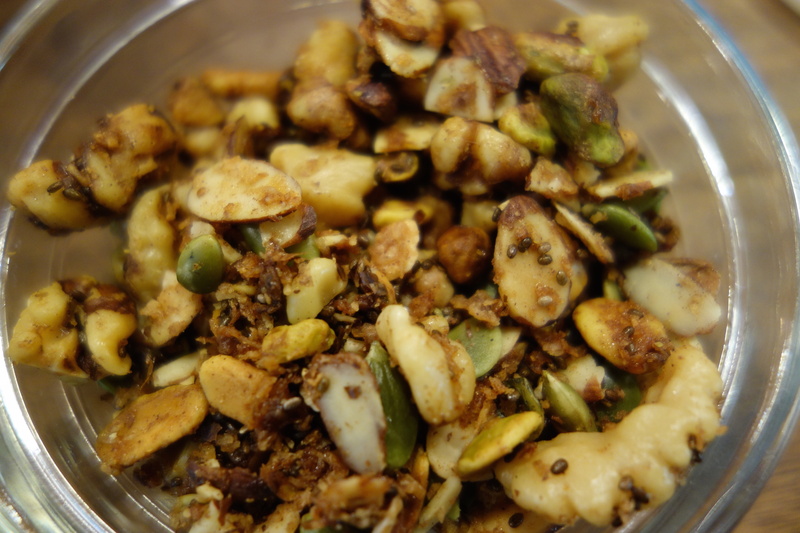 Take the granola out and add the pumpkin seeds, mix well and return to the oven and bake for another 5 to 6 minutes. Take out of the oven and let cool. Store in an airtight container and enjoy!